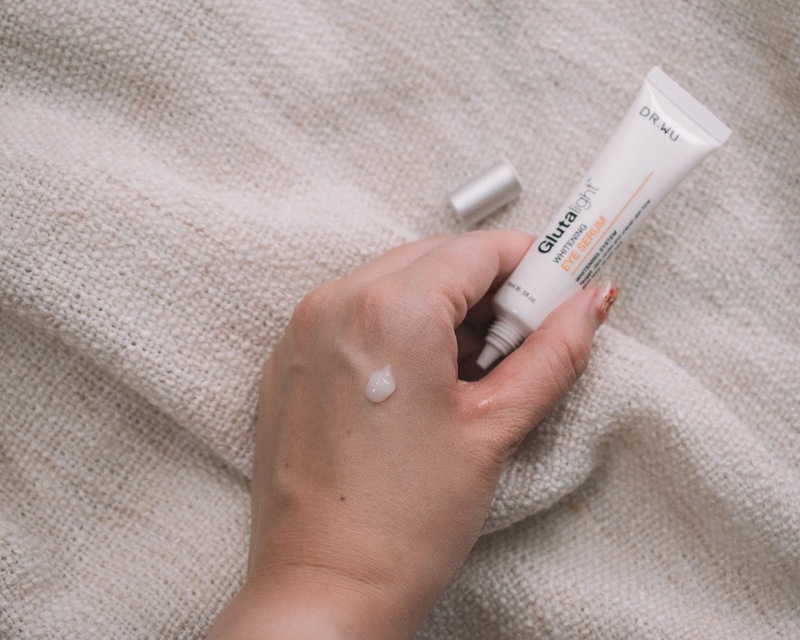 As I grow older and my face continues to experience the occasional (ok maybe regular) acne issues, hyperpigmentation is one of the most troubling skin issues for me. 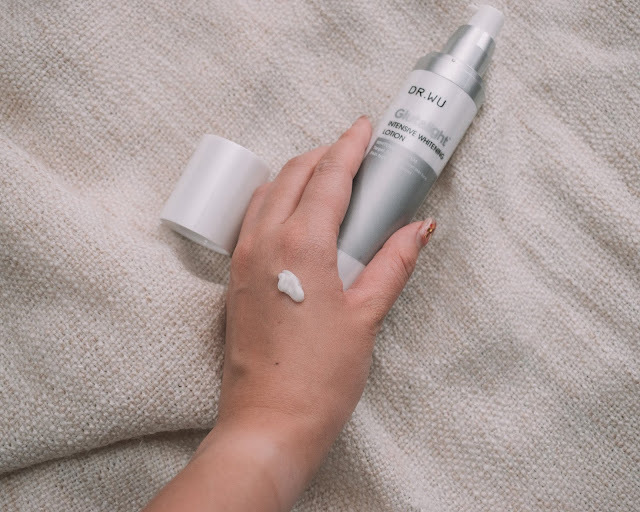 I've a tendency to pick my pimples, and that often results in deep scarring which turns into pigmented marks - which is not a pretty sight without my holy grail concealers or makeup. I've been trying to add Vitamin C serums and products into my skincare regime religiously, but that often takes quite a while for me for results to show. SO, when the invitation came for me to witness DR WU's latest Glutalight Whitening series, I was thrilled. 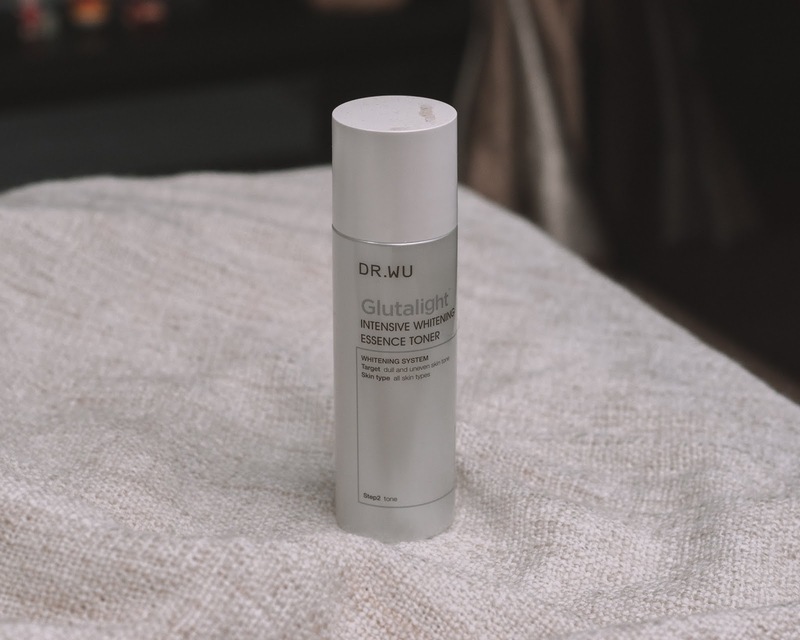 Back story: I've been a huge fan of DR WU's skincare products ever since trying the mandelic acid, and I'm also currently incorporating the hydrating range to my routine which has worked wonders for my extremely dry skin. 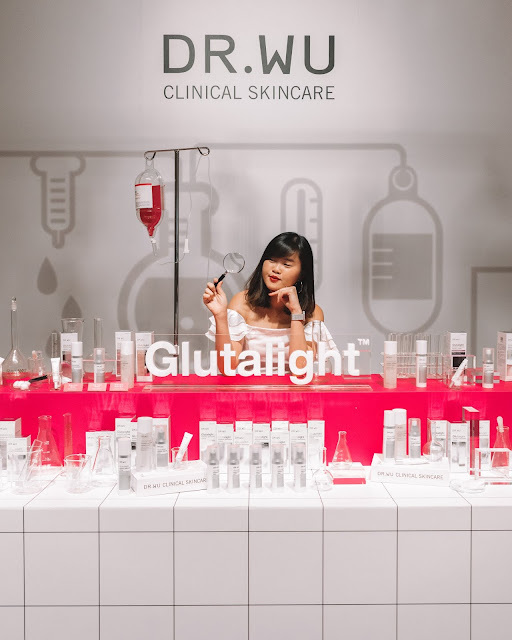 I was freakin' excited when they announced this new Glutalight whitening skincare range because I knew I could depend on it to save my skin once again - it's so powerful that it can even replace whitening injections - a procedure commonly done in Taiwan/China to help ladies achieve fairer skin! The DR WU's Glutalight whitening system consists of a key ingredient - Glutathione which is amazing for curing hyperpigmentation problems. Most people usually get their shot of glutathione through whitening injections done over the span of a few months, but with this new system, you do not have to go under the needle and still achieve the same results. 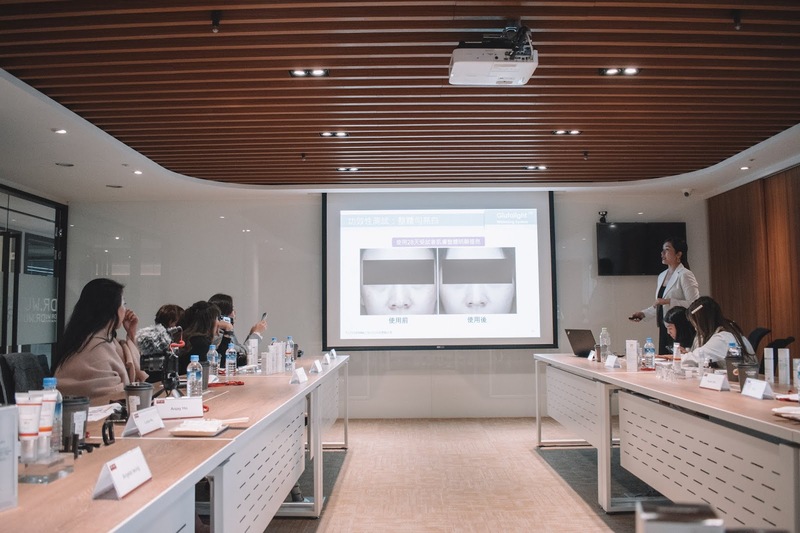 In an independent study done with 24 participants, it was noted that results started to show as soon as 2 weeks! 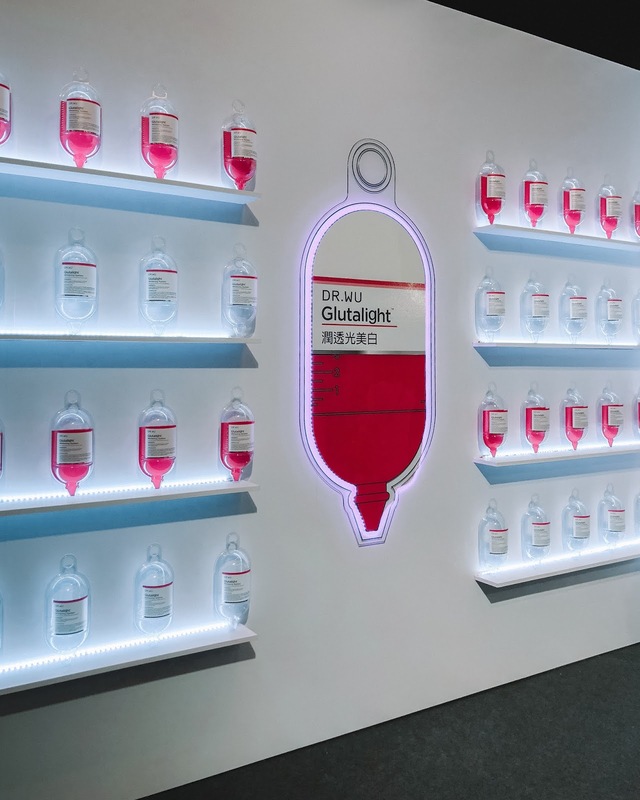 This, of course, still depends on your skin types and usage but for someone who's as afraid of needles as I am, this triumphs over whitening injections any day. 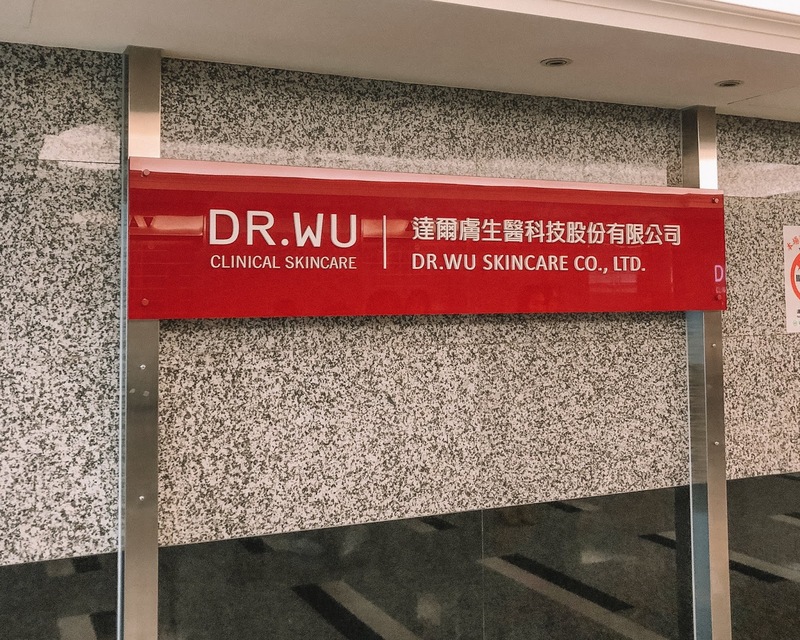 During the trip to Taiwan, we were also brought to DR WU's HQ where we learnt more about the different range of products they carried as well as the Glutalight Whitening range. Unlike other whitening skincare products that may leave your skin with a "tight" feeling (means it's making your skin dry!! 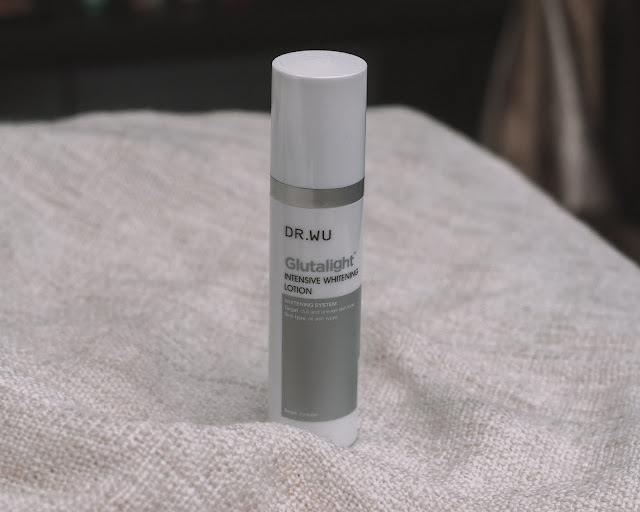 ), the whitening range adds moisture to the skin which helps make it smoother and can also suppress fine lines/wrinkles. 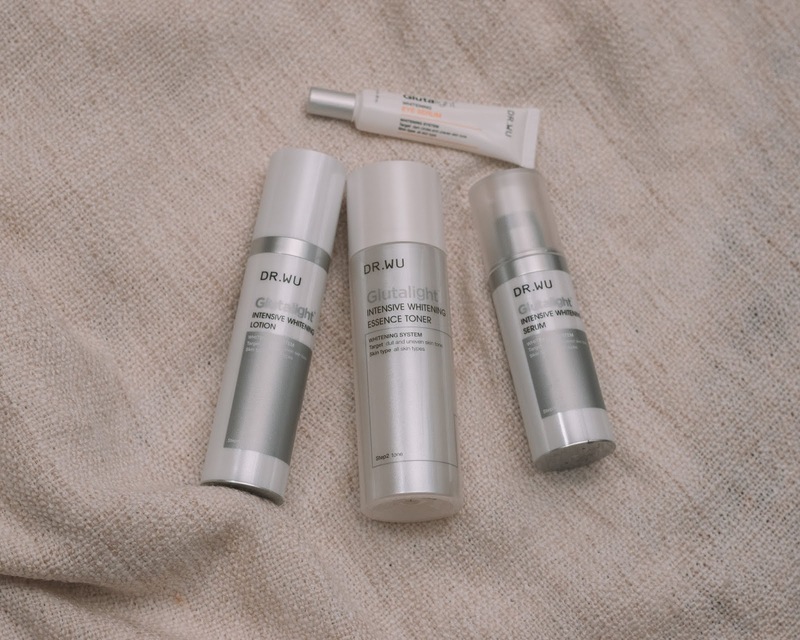 The products are suitable for use in both day and night as they only use acid-free ingredients that do not react negatively to sunlight! 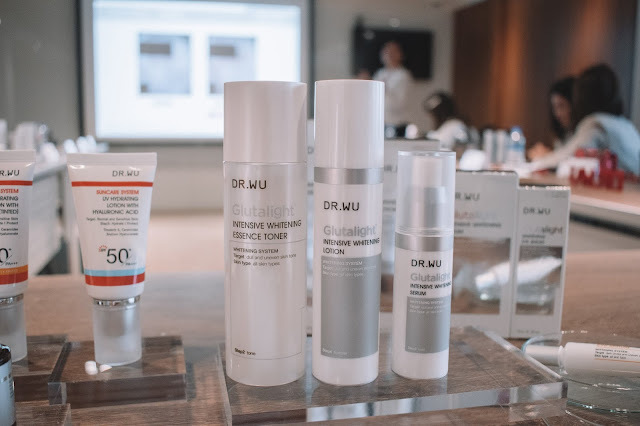 I also couple it with other DR WU's products from the hydration line (DR WU's hydrating serum!!!) because I have reaaaaally dry skin - so this really helps to keep both hyperpigmentation and dryness at bay! 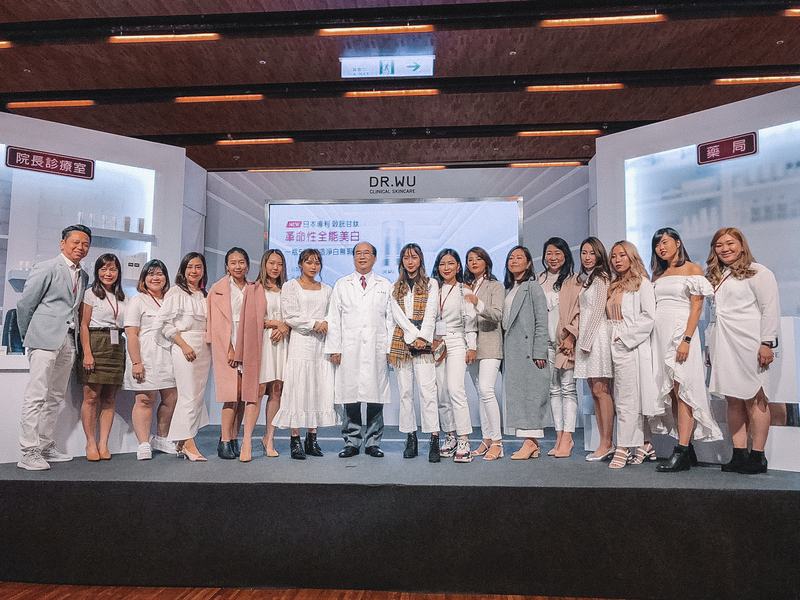 The launch event saw us at a press conference with Dr Wu himself, who gave us a thorough introduction to the brand and how they managed to formulate the products. 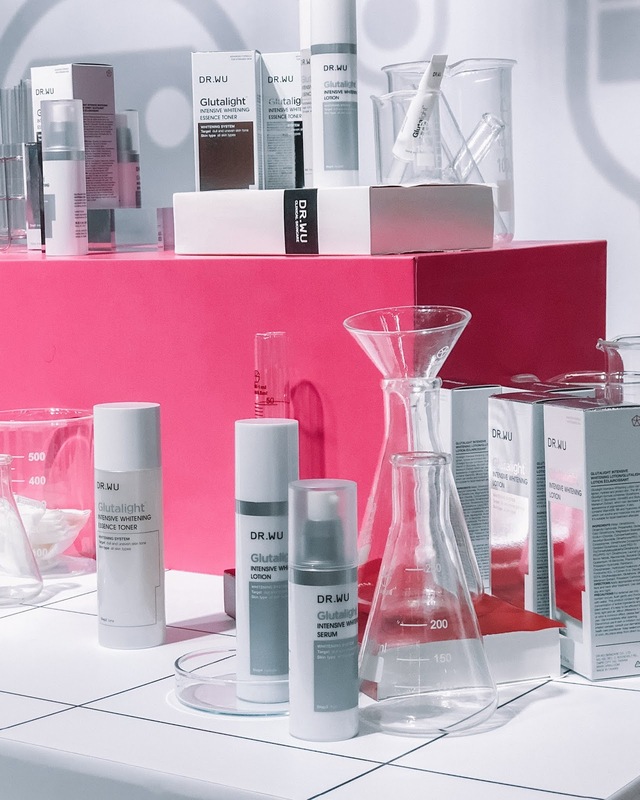 Not only do they not add any forms of acid to the whitening system, but they also adopt an anti-oxidant technology formula that serves as a multi-pronged approach to effectively target melanin in our skin. 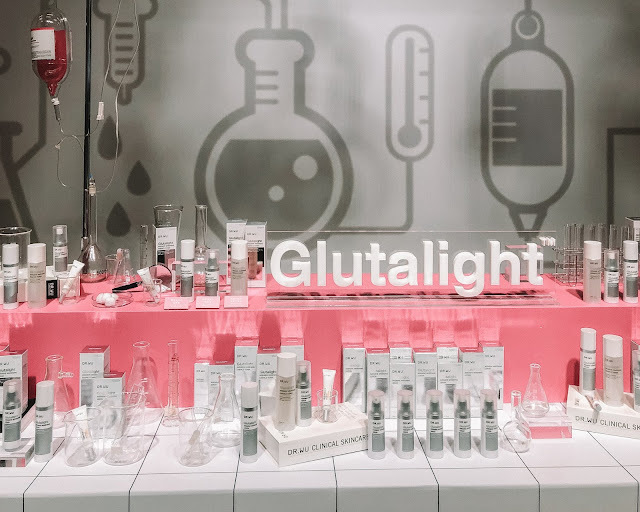 Plus, they are also the first to add the Japanese patented "Glutathione" which includes vitamin B3, B5, B6, silymarin and hyaluronic acid to help skin develop a "defence mechanism" that helps to prevent pigmentation from forming and improving the skin's clarity in the process. It's so important for your skin to fight it's "own battles", and the Glutalight whitening serum provides a shield for your skin during that process! 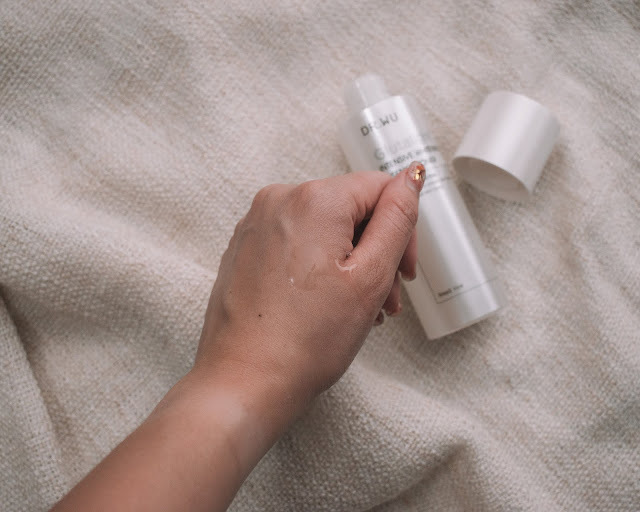 As we all know, using a toner is one of the most important steps in any skincare routine as it helps to remove excess dirt, traces of oil and makeup, and can also correct and balance the pH of your skin. Simply apply it on a cotton pad after cleansing your face, and lightly spread it over your face and neck. Like the previous DR WU toners I've used, this was also really easy to absorb into the skin without making it tacky. 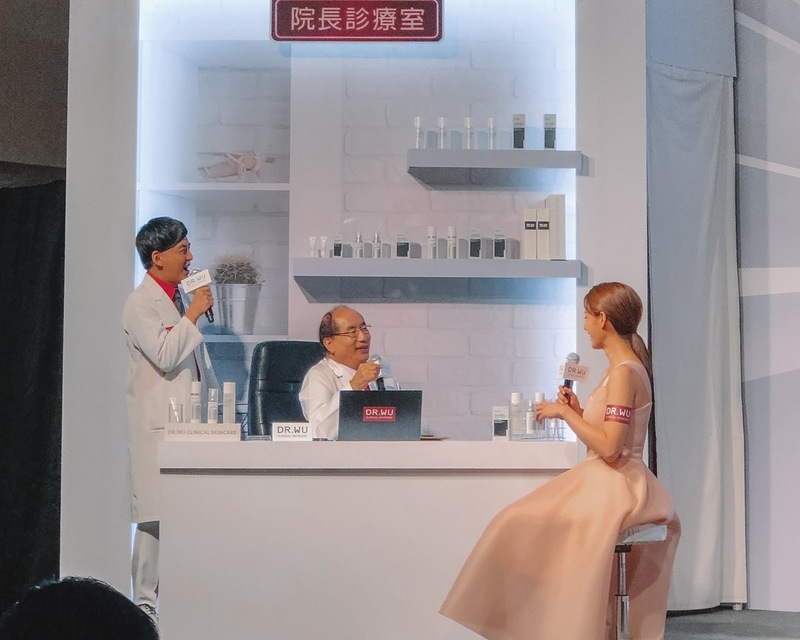 After the Whitening Essence Toner, we then apply the whitening serum which includes Butyrospermum Parkii Butter Extract that can deeply moisturize the skin. 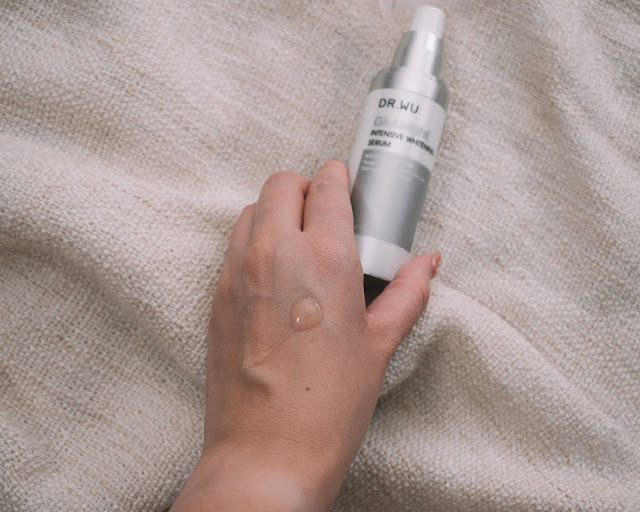 I usually apply this with the hydrating serum to make sure my skin is well-hydrated, but if you don't have dry skin like I do, you can just apply the serum on it's own! 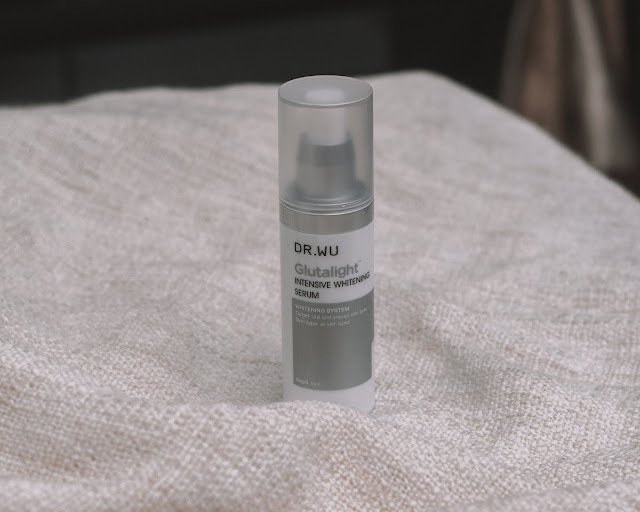 This serum also includes Vitamin C that will have ultra-whitening effects on your skin! Next up, whitening lotion! 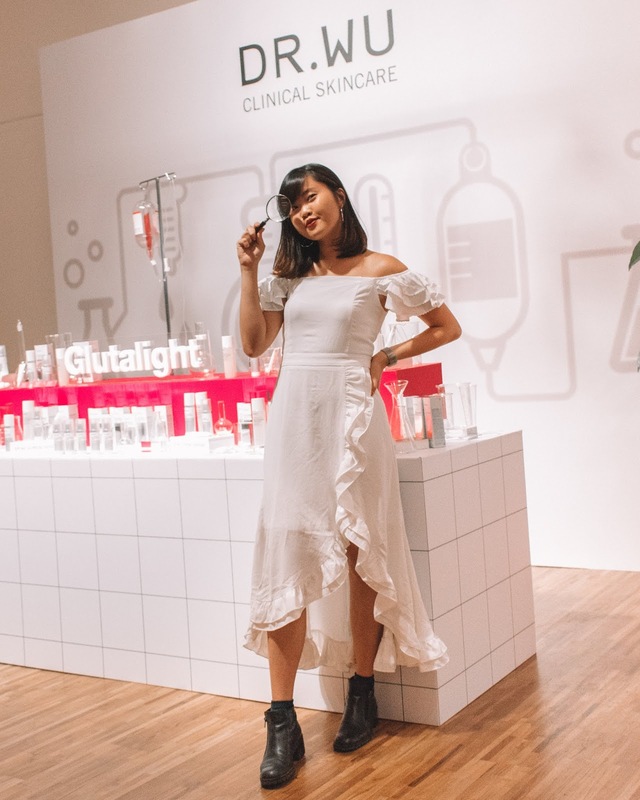 This is also my favourite product from the Glutlight whitening system as it's so lightweight and easy to absorb! The whitening lotion is also formulated with RonaFlair skin softener to improve the skin's tone and radiance. Last but not least, the whitening eye serum! 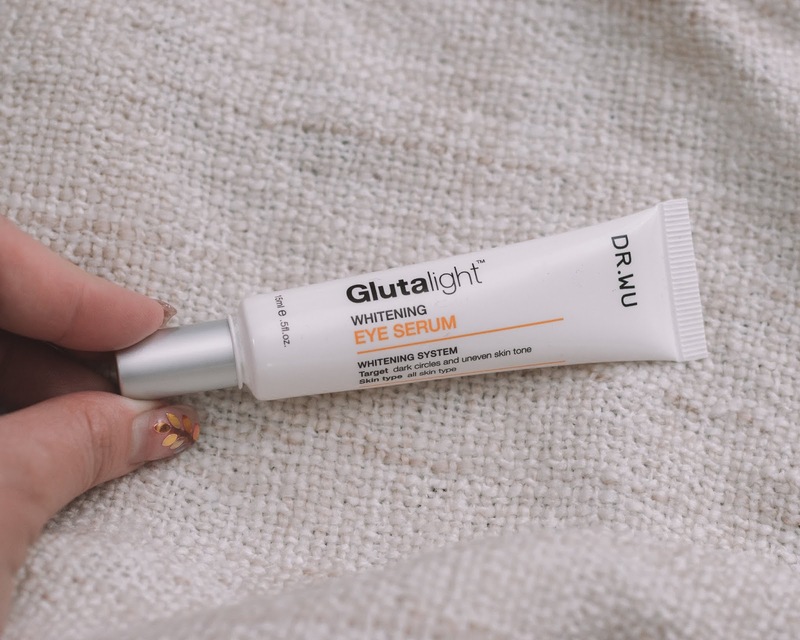 Using Haloxyl™, this product is known to brighten the eyes while tightening and firming the skin around them - also perfect for use during the day and night because it's acid-free! I usually use this as the final step of my skincare routine! For those who are interested in purchasing the range of DR WU's skincare products, you can find them in most major Watsons outlets in Singapore! 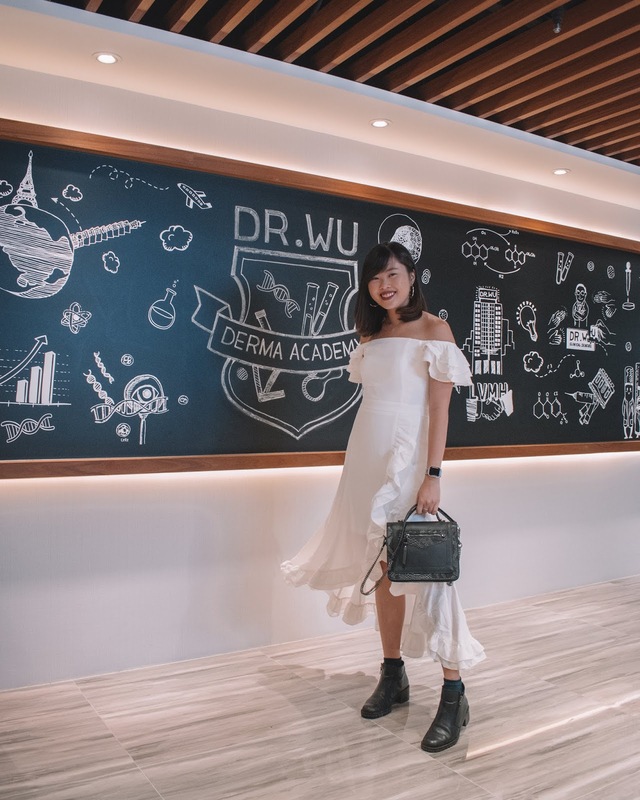 You can also view snippets of my trip to Taiwan with DR WU Skincare here. This August, I got to travel to one of the destinations which I've always wanted to visit, but never got a chance to - Philippines! I've always heard loads of interesting and fun activities people go to the Philippines for, but just never got down to giving it a visit. 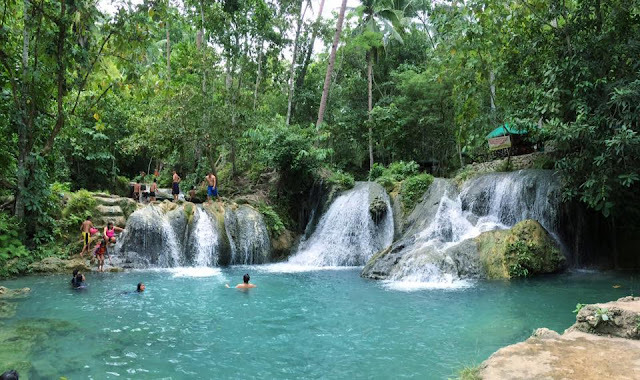 So, last month, I embarked on a mini adventure with Cebu Pacific Air and flew to Davao City for a short 5D4N trip and here are some attractions/activities you can visit or get your hands on while you are there! For those who might not know where Davao City is located or much about it, Davao is one of the safest and fastest growing cities in the Philippines. Similar to Singapore, it's known for Durian, which is also their national fruit (They have over 15 varieties there) as well as the waling-waling, which is a rare orchid species that you can spot on some of their trees. Littering and smoking in public places are also prohibited in Davao, which makes the city really clean too. FYI, the weather in Davao is pretty much like Singapore, and there's no time difference at all! Commuting wise, you can always count on either Grab/their local taxi service to bring you around. 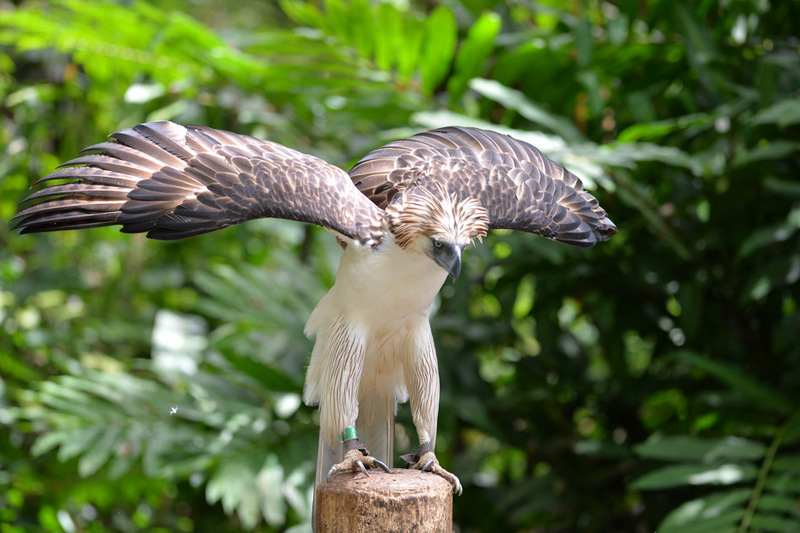 The Philippine Eagle Centre is home to the Philippine Eagle, which is also the national bird of the city. There, they breed/rescue these birds and give them renewed homes to live in, while still making sure they stay close to their natural habitat. 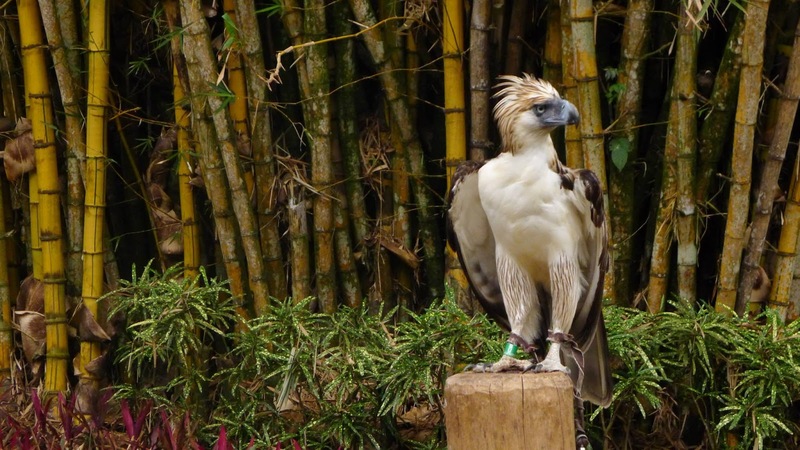 The Philippine Eagle Centre takes pride in caring for these endangered species, along with other birds and reptiles in the conservation and also educates the public on the realities of these creatures. They also provide an option for the organisations/the public to donate and care for these animals. You can click on this link to find out more. 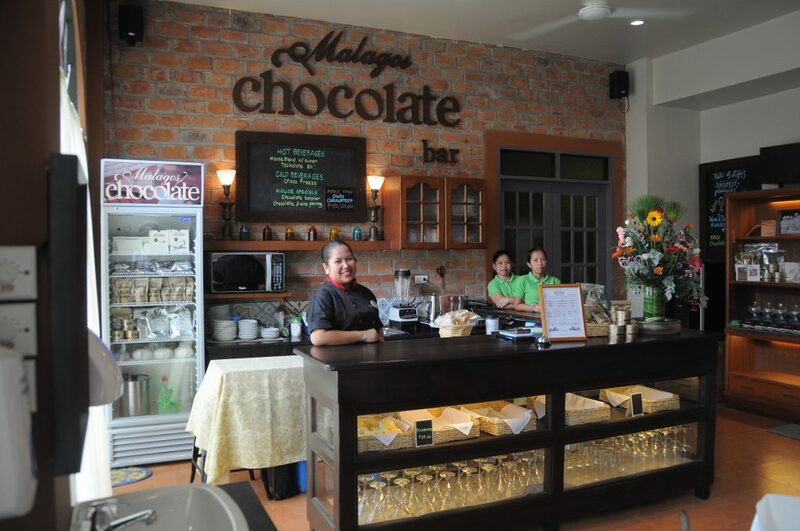 If you're looking for some hands-on activity, then you have to visit the chocolate laboratory at Malagos Garden Resort. 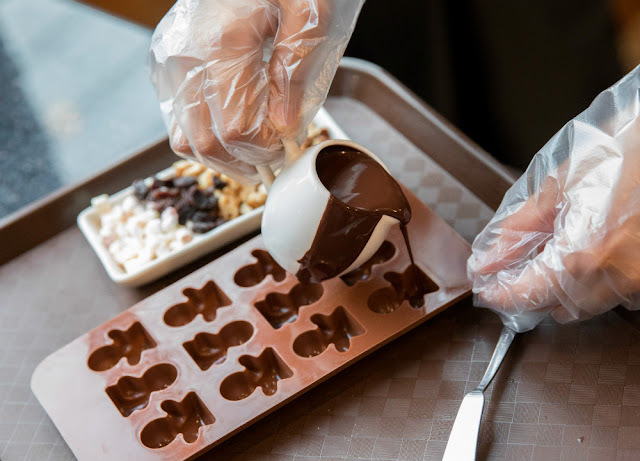 There, not only can you learn the intricacies of the history of chocolate in Davao, but also experience making your very own chocolate with a wide selection of toppings and moulds to choose from. While waiting for your chocolate to cool down, you can also take the chance to visit the Butterfly Garden or the Malagos Bird Feeding Dome! Other than diving, Davao is also for their extreme water sports - with whitewater rafting as one of their main tourist activities! We were first brought to sign our waivers and given our life vests and helmets, before heading to the whitewater rafting destination located at the river banks of Davao river! Throughout the entire experience, you'll be followed by experienced rafters/trainers, as well as a photography/videography team who will help capture the moments for you. We were also given an orientation on how to rescue your teammates when they fall into the water, and also how to manoeuvre the rapids. The rafting experience took around 2-3 hours as a whole and along the way, we met with some major rapids and also the "washing machine" which was one of the stronger rapids and highlights of the river. And, if you are afraid that you might fall out of the raft, not to worry as the guides will always be there to help you, and the river is really quite shallow since we chose the Beginners whitewater rafting route. Just make sure you follow the instructions and safety procedures, and you'll be good to go! We also had a friendly competition with the other team but since we were always lagging behind, we decided to just take a chill pill and enjoy the journey hahaha. But really, this was one of my favourite experiences of the trip! And also one of the many highlights of my trip! Nevermind that I dropped my phone into the sea (which is why I also lost my photos for the first 2 pointers) but really, this is the most breathtaking resort I've ever been to with the most beautiful rooms. You literally get to wake up by the sea. 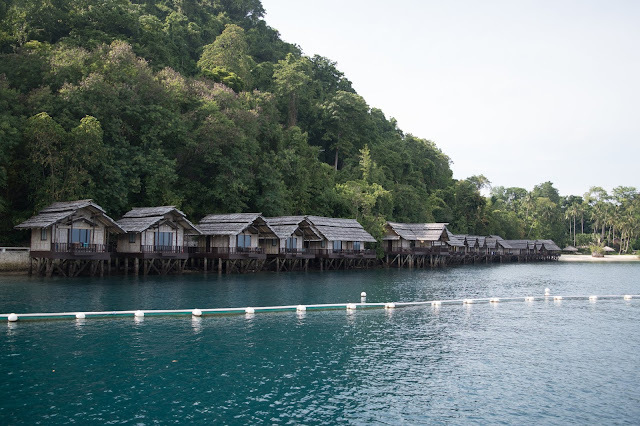 The 5-star Pearl Farm Resort is located at Samal Island, which is around a 45-minute journey from the Pearl Farm Wharf at Davao. 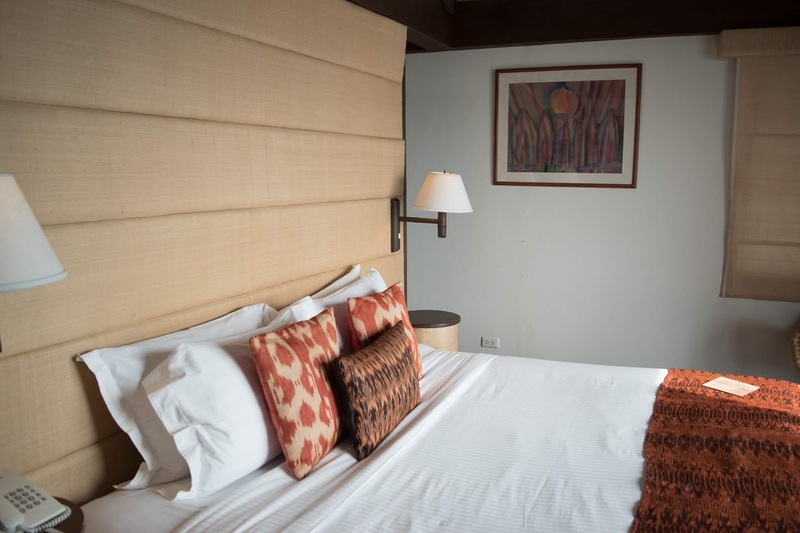 There, you get to disconnect from the bustling city life and take heart in the pristine beaches and lush greenery that Davao also offers. 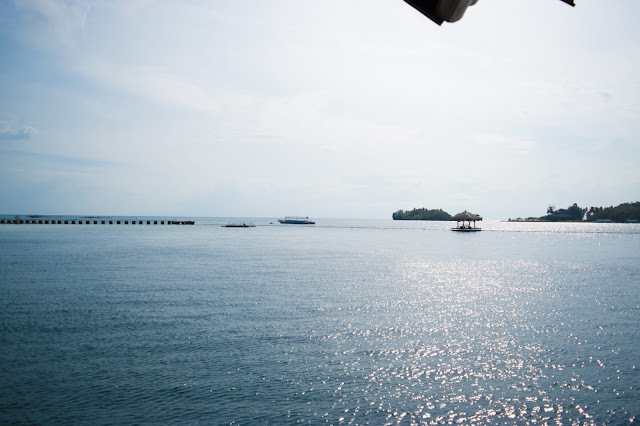 I stayed in the Samal room which is built on sea waters. The room is patterned after the stilt houses of sea-faring Samal Tribes of the Sulu Archipelago, and also offer westward views of the sea, sunset and surrounding islands that you can view from your private balcony. Staying in the Pearl Farm Resort also comes with a free buffet breakfast and an in-room massage service at your back and call. However, do note that staying in nature also comes with its cons. 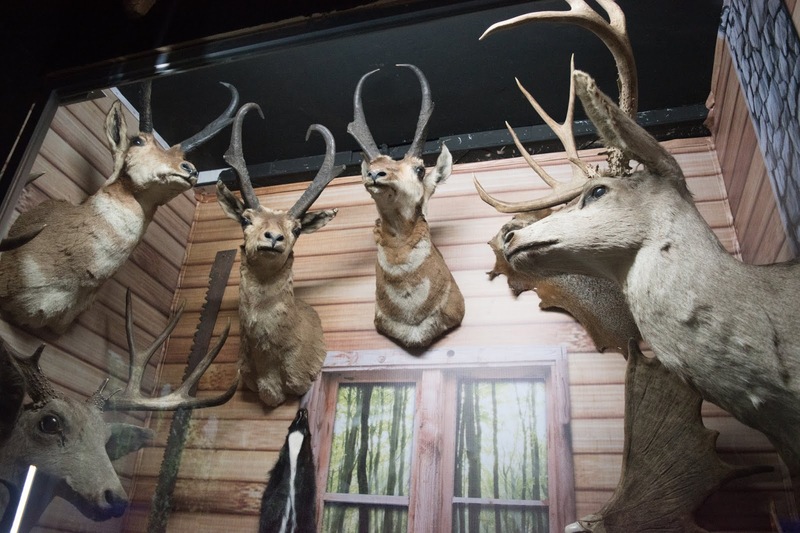 You might also come in contact with wildlife creatures like lizards, geckos, mice or spiders in your rooms, but just give the housekeeping team a call and they'll be rid of them in no time! 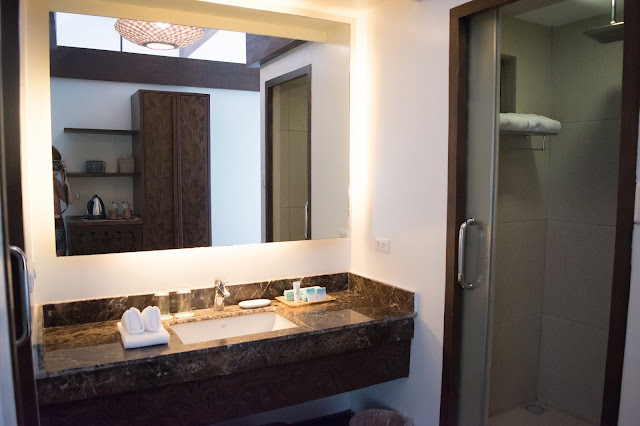 In my opinion, this resort is perfect for a romantic getaway where you and your loved one can indulge in a romantic dinner set-up by the beach. If you're lucky, you can also catch the resort's fire dancers in action! Other than the infinity and Mandaya pools, you should also give their Mandaya weaving huts a visit where you can learn more about the culture of Davao which features the exquisite Mindanao's weaving craft which is usually seen in many of their uniforms or souvenirs! If you're someone who loves to be close to nature, you can even join them in the coral tours where you can experience snorkelling in the Marina sanctuary - something we tried and also managed to spot many lifeforms in the sea - think Nemo, starfish and even clams! All you need to do, is head over to the rental area, fill in a form where you'll be handed your snorkelling equipment and you'll be good to go! 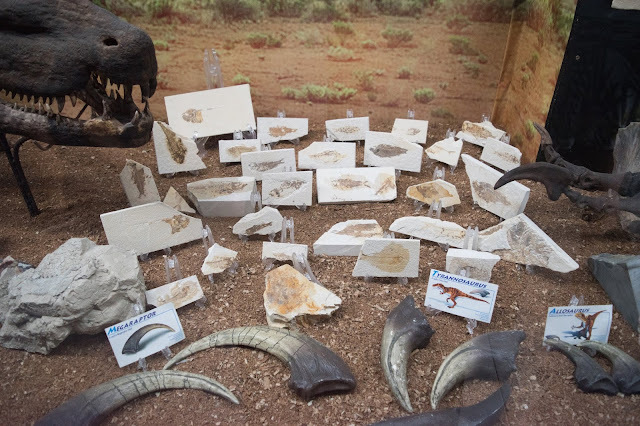 Since you are already on the island, you should seize the opportunity to visit the bat caves around the region. 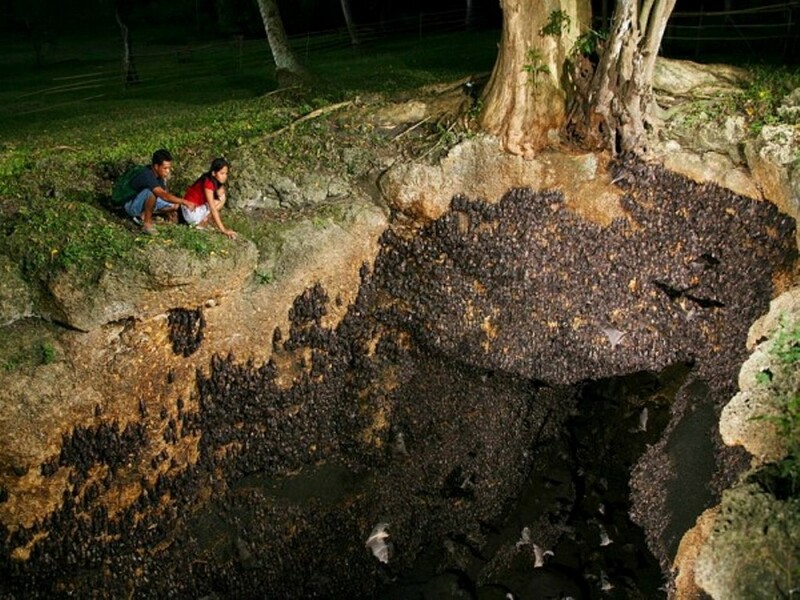 The Monfort Bat Sanctuary is home to a fruit-eating bat population of 2.5 million, and also a place for bats in different stages of their lives to reside in. However, do be warned that the smell of the bat droppings can get reaaaaally pungent, so do prep yourselves before entering! Take a respite from the heat at the Hagimit Waterfall where you can find the best photo spots. The area is made of smaller waterfalls of 3-5m high, and one of the best ways where you can commune with nature. You can also choose to stay overnight in the area at their surrounding cottages! 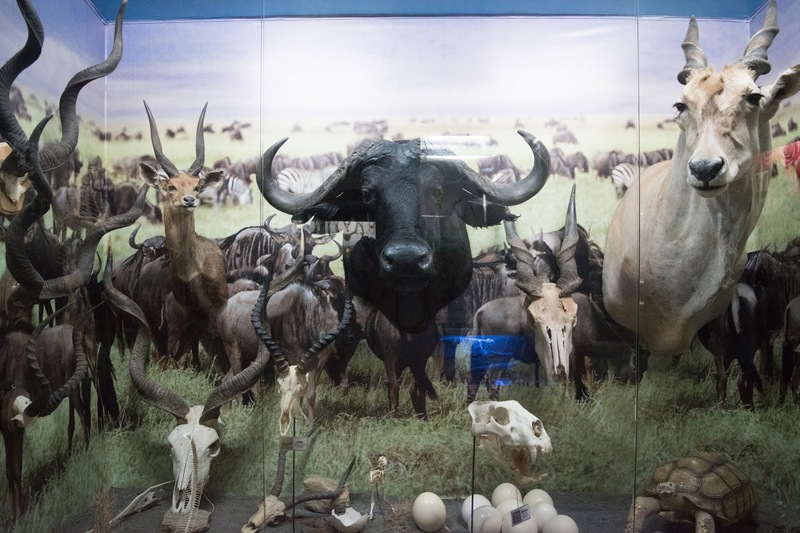 Go on a short tour at the D'Bone Collector Museum, where it houses over 700 species of bones, skulls and skeletons. 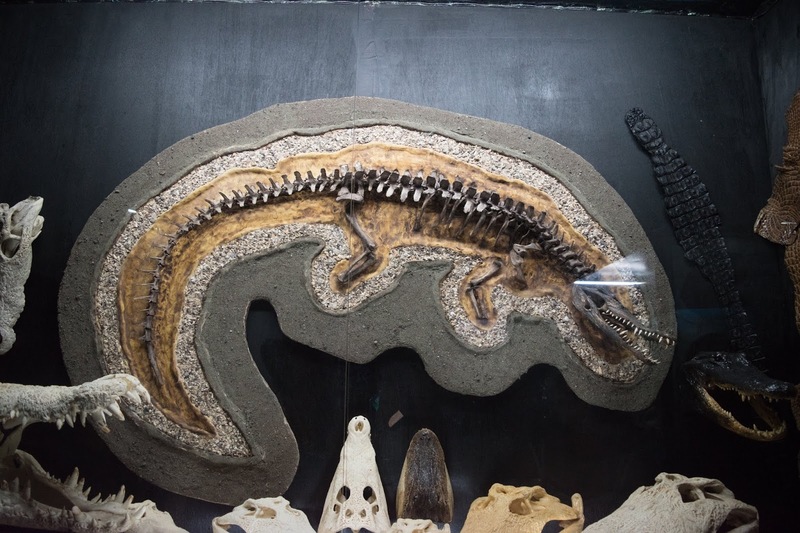 From tropical rainforests to the seas and oceans of the world, you can get to meet both land and water species and learn about the consequences of water pollution that brought the deaths of some of the exhibits in the museum. The bones are gifted by countless donations from all around the world, and amongst these collections include a 41-foot long sperm whale, bones of Grizzly bear as well as bones and skeletons of snakes, tarsier, marine turtles, various fish species and different sizes of the mouths of sharks. 8. Eat the king of fruit - Durian! As mentioned, Davao is known for over 15 species of Durians, and even though we didn't manage to try all 15, we were fortunate to taste 3 of them - Puyat, D101 and Kob with plump, juicy flesh that boasts a distinct sweetness that was unlike any other Durian I've ever tried in Singapore/Malaysia. Other than Durians, we also tried their local mangosteens and Marang, which falls under the family of jackfruit and is a native fruit to Mindanao. The flesh was sweet, creamy, but less pungent to that of durian/jackfruit. I just kept reaching for seconds! If you are also keen on flying to Davao City, you can fly to more fun with Cebu Pacific Air with prices as low as S$68! 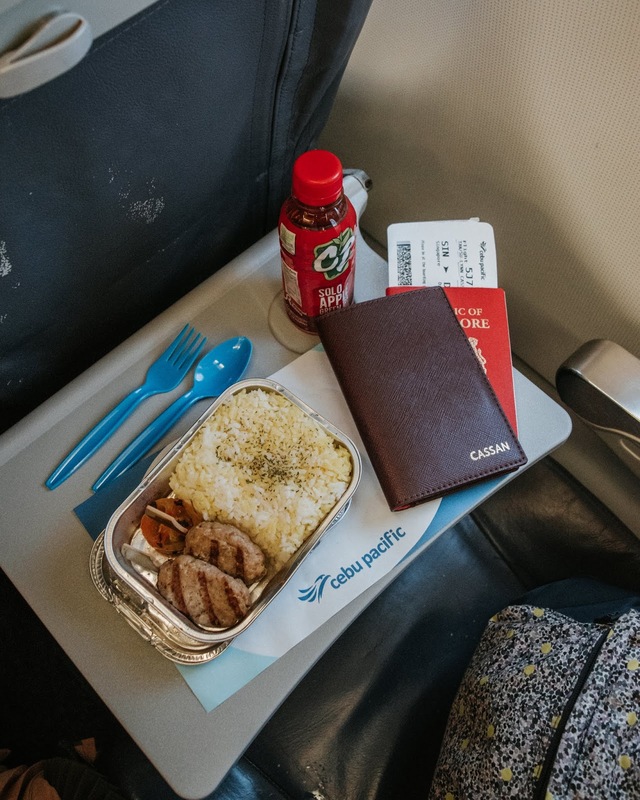 My overall flight experience was pretty pleasant, and during the return flight, the flight attendants even started a little guessing game where the winner could walk away with exclusive Cebu Pacific Air merchandises! For someone who has never been to the Philippines, I must say that this was one helluva experience that would easily prompt another visit - probably to Cebu next since I've also heard many wonderful things about that island! If you're someone who loves to be in tune with both nature and city life, I would highly suggest you give Davao City a go.